What Are The Best Laptop Cooling Pads? Are you searching for the best laptop cooling pads? You need cooling pads for your laptop if you use your notebook for extended hours. Do they work? A subjective question. Today, you learn about laptop cooling stands, laptop cooling pads or laptop coolers. Call them what you like! They all do the same thing. Prevent your laptop computers from overheating. Laptop coolers are the best way to keep your laptop cool and functioning to its highest potential. A laptop cooler provides airflow for optimum performance. Furthermore, laptop cooling pads often make using a notebook more comfortable. Are you a heavy gamer? Does your gaming computer overheat? Try a laptop cooling device. Should I Buy A Laptop Cooler? Intense applications like gaming or video rendering cause some laptops to overheat rather quickly. Overheating leads to decreased performance and subsequent internal damage. However, notebook coolers alleviate laptop overheating issues. The best notebook cooling pad increases airflow to the internal components of your laptop. The computer cooling pad accomplishes this with powerful fans that push a constant stream of cold air throughout the laptop. So, do you want to keep your laptop from overheating? If yes, then invest in the best laptop cooling solution. Laptop Coolers: What to Look For in a Good Laptop Cooler? Some laptop coolers excel in portability. They offer a slim, streamlined design and easily fit in a laptop bag. Other notebook coolers focus on adjustability. These coolers provide increased comfort during long hours on your computer. Whatever your needs, there is a laptop cooler for you. The most important aspect of a laptop cooler’s performance is the amount of air it circulates. Noise is another factor that is important to consider. Spending time at work or play on your laptop? You don’t want any sounds to distract you from what you’re doing. Fortunately, most laptop coolers are quiet and average only about 24 dBA. 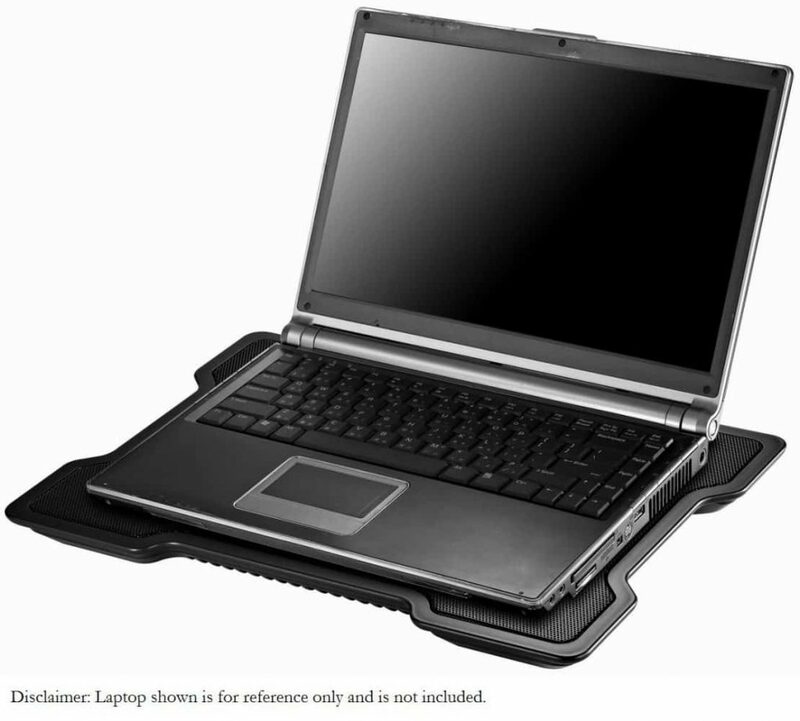 Performance for a laptop cooling pad depends on the amount of air the laptop cooling pad circulates. The more powerful the laptop cooling pad’s fan is, the more efficient it is at cooling your laptop. Typically, we measure Air circulation in CFM (cubic feet per minute). The distribution of air varies among differing laptop cooling pad models. The most powerful laptop cooling pads push upwards of 70 CFM. However, lower-end or a cheap cooling pad may reach just 20 CFM. Furthermore, the greater the circulation, the higher price tag. So, choose a cooling pad with the best power to price ratio for you. Noise is the next important factor. As mentioned above, most laptop coolers are quiet and average only about 24 dBA. Also, many USB powered laptop cooling pads offer an additional port. D you use extra peripherals with your portable computer? You won’t necessarily worry about a lack of ports for the cooling pad. Furthermore, the number of fans impact a cooling pad’s overall performance. Before purchasing any laptop cooling pad, identify the hotspots of your laptop. Inspect the cooling pad to ensure that the layout of the notebook computer cooling apparatus targets these locations. A laptop cooler’s design affects the way in which you use your laptop. For this reason, consider how you usually utilize your computer. Do you prefer to use the laptop at a desk? 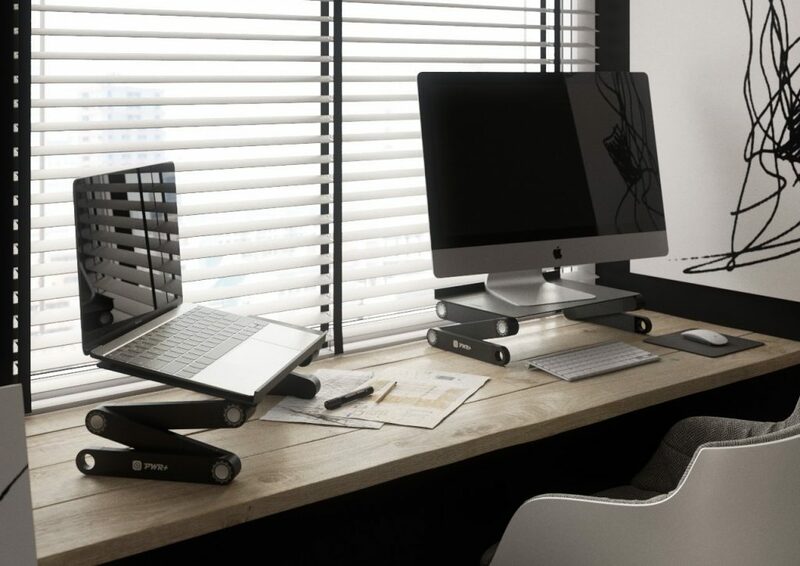 In this case, a cooling stand that offers height adjustments allows for comfortable viewing angles. Do you prefer to use your laptop on your lap or in bed? Laptop coolers with rounded edges and elevated fans provide uninhibited airflow despite being on uneven surfaces. Laptop coolers of this design, however, are not usually portable. Also, these coolers tend to be bulky. Moreover, notebook coolers designed for travel often sacrifice adjustability and comfort for a “packable design”. Also, consider the durability of the laptop cooler before you purchase it. The most durable laptop coolers feature sturdy plastic, rubber reinforcements and often feature a metal mesh top panel. Some models also include a convenient place to store USB power cables . Let’s dive into the top 5 laptop computer cooling pads. The features, design and everything that makes them stand out from the rest of the cooling devices on the list. Firstly, the HAVIT® HV-F2056. 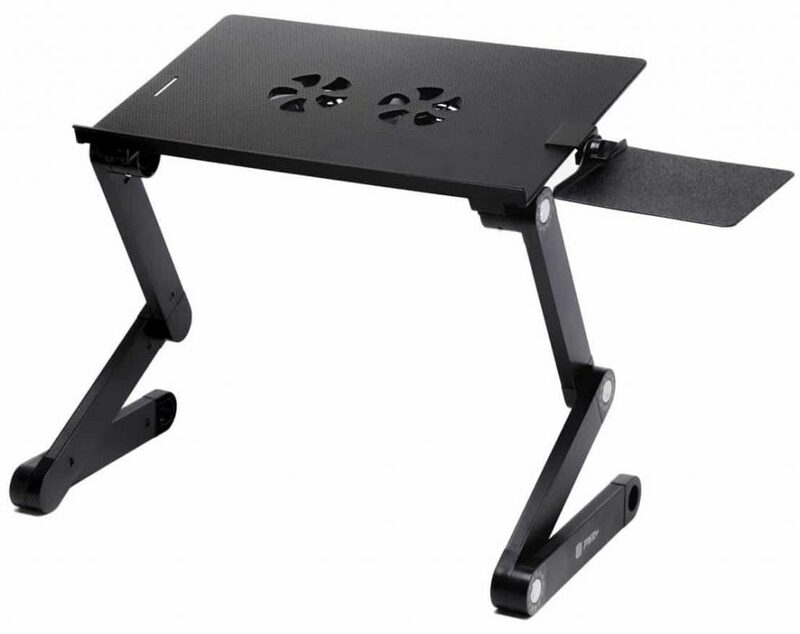 Secondly, the Pwr+® Portable Folding Laptop Notebook Book Table Desk Tray Stand . 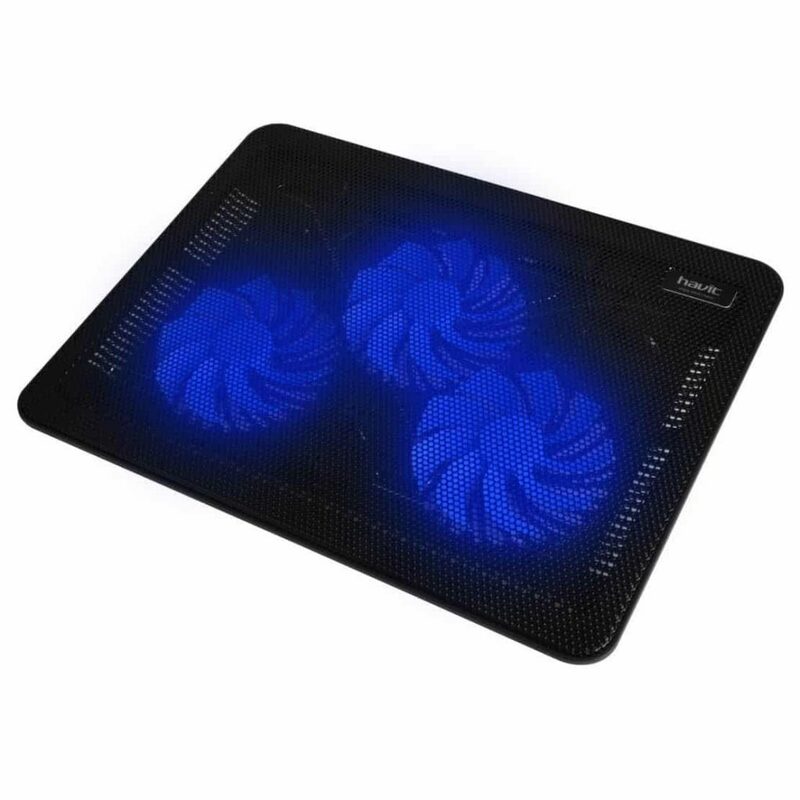 Third, the AVANTEK 15-17” Laptop Notebook Cooling Pad Chill Mat. 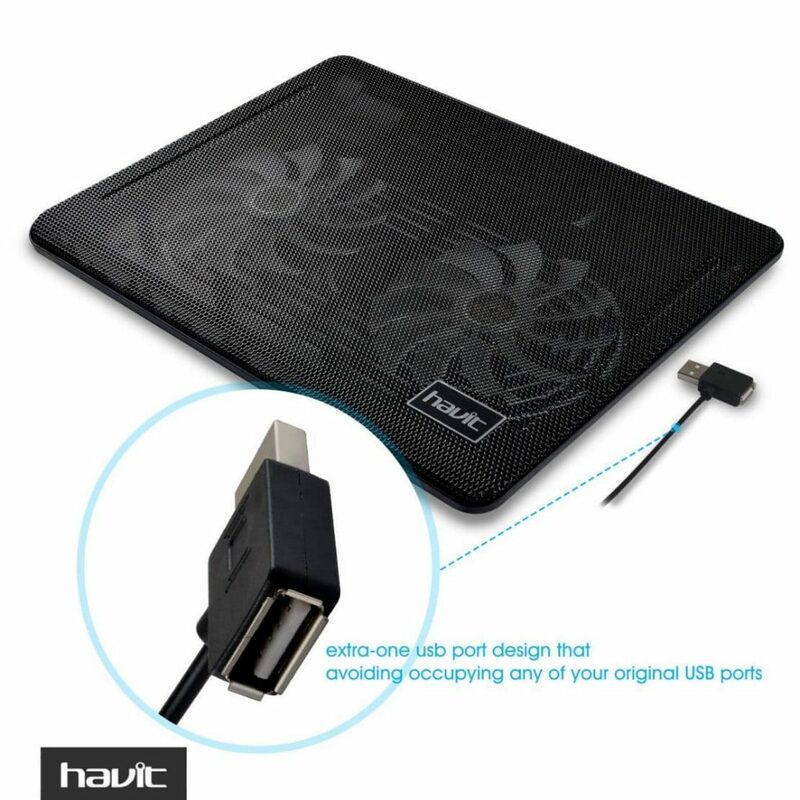 Fourth, the HAVIT® HV-F2033 14-15.6″ Super-slim Laptop Cooler Cooling Pad . 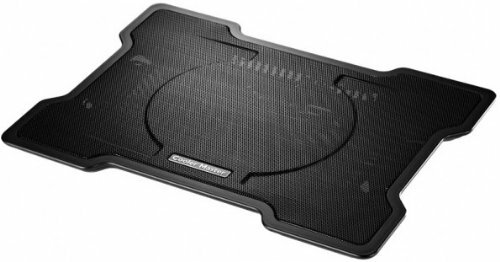 And, fifth, Cooler Master NotePal X-Slim Ultra-Slim Laptop Cooling Pad . The Havit HV-F2056, an ultra portable laptop cooler, keeps your laptop cool while on the go. The Havit HV-F2056 measures just over an inch and weighs about 1.6 lbs. This design allows for a rather portable laptop cooling pad. Furthermore, the HV-F2056 doubles as a laptop cooling stand. It features an ergonomic extender which allows for comfortable angles for everyday usage. The Havit HV-F2056’s high-quality multi-directional metal mesh makes your laptop wear resistant. Also, it provides a stable laptop carrying surface. The HV-F2056 equips three large 110mm fans providing a powerful 65 CFM of air flow. 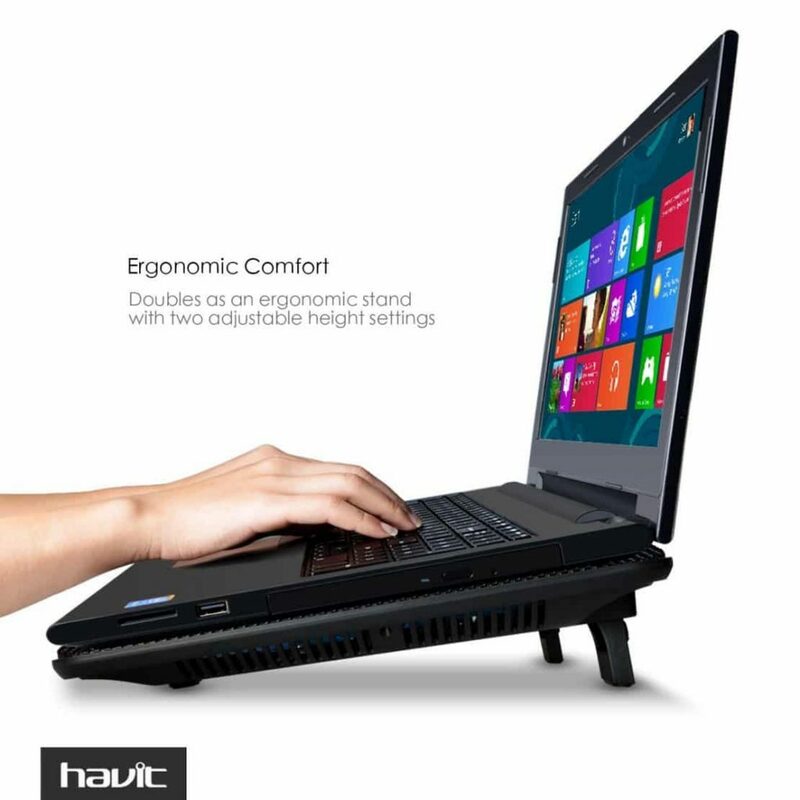 At this circulation, the Havit HV-F2056 keeps overheated notebook components cool. Furthermore, the HV-F2056 has a very low noise level. Did we mention that the Havit HV-F2056 features two additional USB ports? Yes, it does! The Havit HV-F2056 is an excellent high-quality product that comes with a full one year manufacturer’s warranty. For more features, price & reviews, check it out on Amazon. Watch this video. 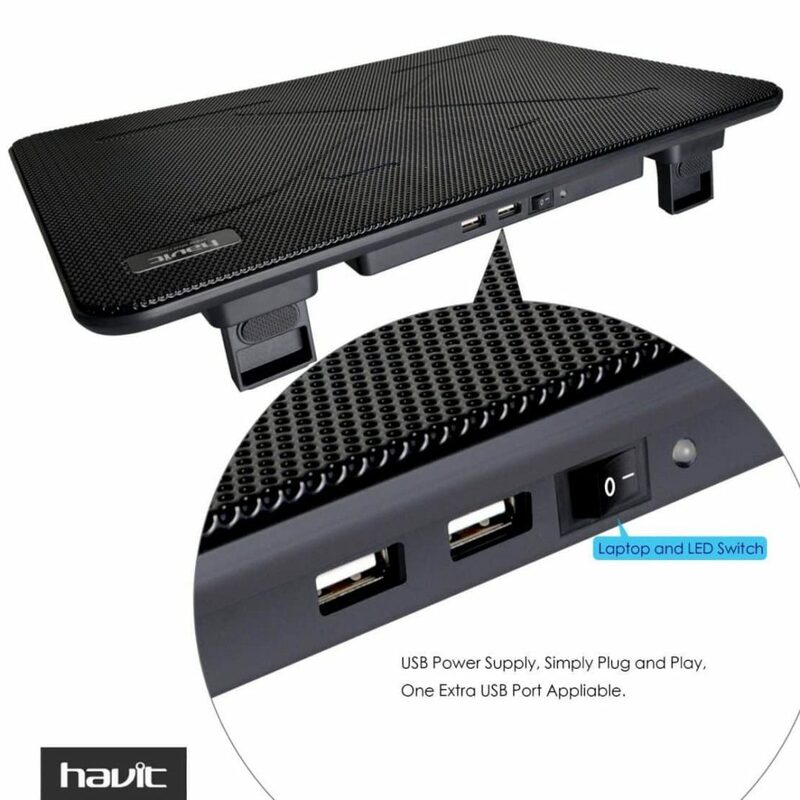 Find out what I thought of, and details on, the Havit HV-F2056 Slim Laptop Cooling Pad. Cooling is necessary if you are gaming on your laptop, especially for extended periods of time. Do you want to buy a cooling mat that does the job and works best with your laptop? In this video, I tell you how to choose a cooling mat. Also, I explain why I selected the Havit HV-F2056. Don’t forget to share this post if you found this video useful. The Pwr+® Portable Laptop Cooler is a foldable & portable laptop cooler. The Pwr+ features two robust and silent hydro-bearing fans. These fans reduce the overall temperature of your laptop computers and provide steady airflow in and around the device. The Portable Laptop Cooler distributes air evenly. Furthermore, the two fans consume little energy. Thus, you need not worry about your laptop’s battery life. Moreover, despite the low power consumption, the fans are powerful. Perhaps, most notably, is the Pwr+’s adjustable auto-locking legs that rotate 360 degrees. No matter the location, the Pwr+ Portable Laptop-Table-Stand ensures comfortable viewing angles which reduce neck and shoulder strain. Unboxing: Pwr+ PwrAir Adjustable Vented Laptop Table Notebook Computer Desk Portable Bed Tray Stand with 2x Fans and Heat Sink Aluminum Top for Accelerated Cooling Pad Ergonomic Design – Up to 17″ – Black Fans. The AVANTEK Ultra Slim Laptop Cooling Pad‘s metal mesh supports various laptop sizes up to 17 inches. This ultra thin laptop cooler provides a stable surface for you to work on any laptop in comfort. The dual over-sized 160mm fans with blue LEDs spin silently at 1000 RPM. 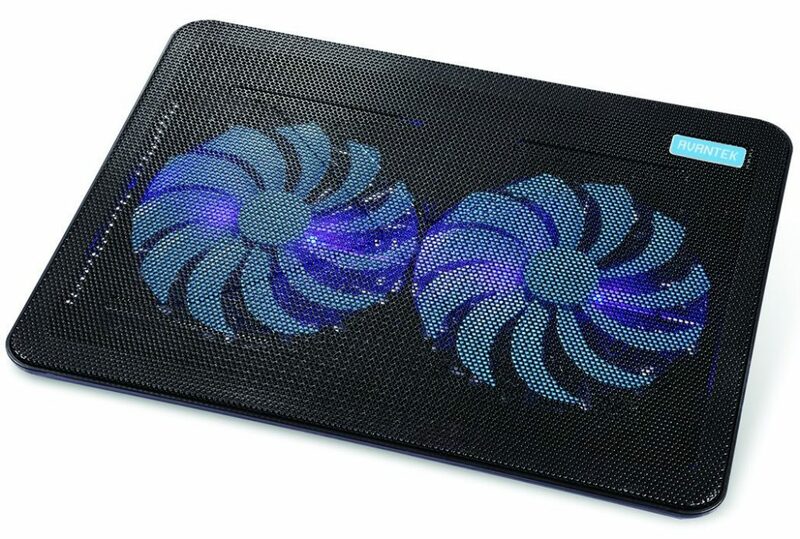 Both fans pull in cool air from the bottom of this laptop cooling pad. Also, the full range metal mesh optimizes airflow. The airflow rapidly dissipates the massive amount of heat generated in the laptop housing. Moreover, the adjustable feet of this cooling pad offer two height settings. 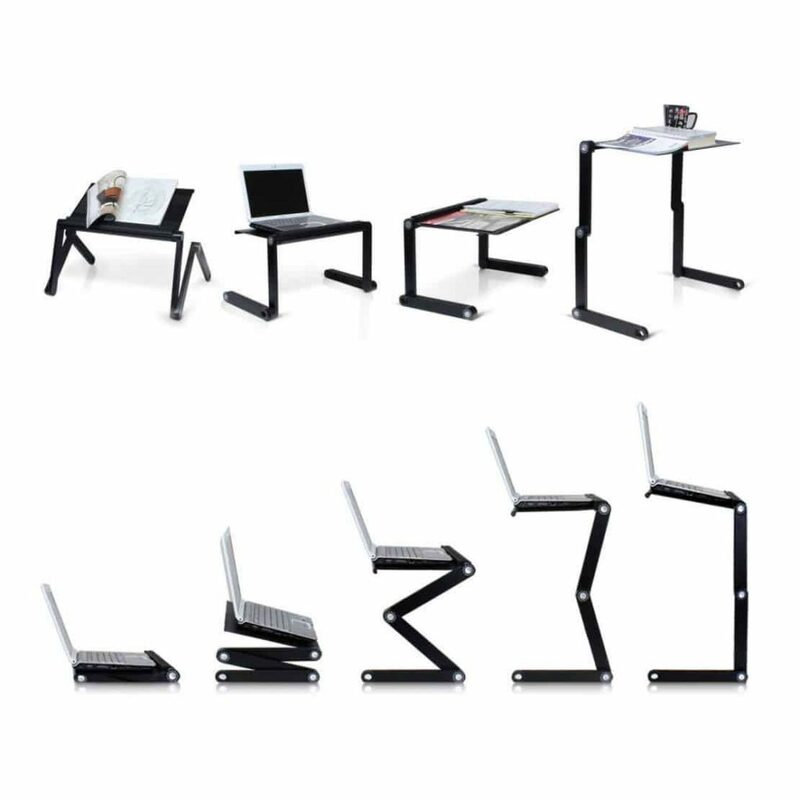 Position your notebook at an ideal viewing or typing angle. The Avantek Ultra Slim Laptop Cooling Mat also needs no power adapter (USB Powered); the pad offers an additional USB port to connect extra peripheral devices. The HAVITHV-F2033 features a super-slim design, suitable for 14-15.6 inch laptops like the Apple Mac Book Pro , Ultrabooks & Notebooks. Also, the anti-slip surface design holds laptops firmly. The HV-F2033 is portable and durable. Ideal for home & office use. The HAVITHV-F2033 comes with a massive punching empty net surface and two powerful motor turbofans capable of dissipating heat from your laptop’s critical components very quickly and that too, without making much noise. 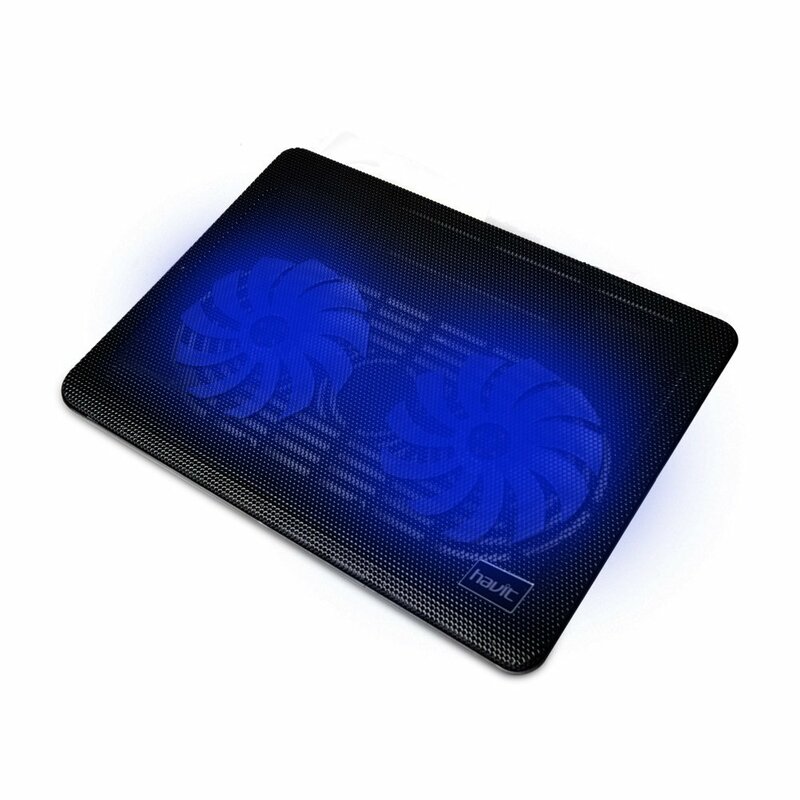 The Cooler Master NotePal X-Slim Ultra-Slim Laptop Cooling Pad features a single 160mm fan. The NotePal X-Slim’s Mesh surface and one fan provide a chill mat for your laptop & notebook computers. Also, this high performance 160 mm fan can spin at approximately 1500 RPM. Furthermore, the heavy-duty, yet ultra slim profile is great for gaming laptops. The Cooler Master NotePal X-Slim Ultra-Slim Laptop Cooling Pad‘s perforated metal mesh surface optimizes airflow and provides a chill mat for your overheated laptop. Further, it uses a USB power connector with a pass through functionality so that you don’t lose a USB port. It’s two height settings allow you to quickly adjust the X slim’s incline to your preferred viewing or typing angle. I was looking for an economical and practical laptop cooler and settled on Cooler Master’s NotePal X-Slim Laptop Cooling Pad. First, let me say that there are a lot of laptop cooling pads on the market. Some have LED lights, which is neat, but you never see them with a laptop sitting on it. So why use the extra power, including the laptop battery, to power a function that is not practical? Other coolers feature multiple fans or fans that you move and position where you want them. Most of the re-position-able fan have cheap plastic tabs that break. Because of this, I kept it simple and am very happy with my Cooler Master laptop cooling pad. The full metal mesh surface was the key selling point for me. Just getting a laptop off of a flat surface with poor air circulation will greatly assist in the cooling process. The full mesh on this unit allows the entire laptop base breathing room. Additionally, the USB 2.0 port extender means that I can power the cooling pad without losing a high-speed USB port. Heat is an enemy of most electronic devices. Are you using a laptop computer on a flat surface? A cooling pad will surely help to extend the life of your laptop. The best laptop coolers feature powerful yet silent fans. Furthermore, the best laptop cooling pads allow for portability and comfort.